February may not be the traditional month for nativity plays, but is always a great month for comedy, so I was delighted to be invited by Hallam 89’ Theatre Club, a local theatre company who I have not had the privilege of coming across before, to see the opening night of their production of The Inaccurate Conception at Sheffield University Drama Studio. Myself and the rest of the audience were drawn into the classroom chaos of Celia Whibley, the young teacher of class 3C at Verruca Street Primary School, having the production of the school nativity play thrust upon her. The unprepossessing and uncooperative children are the least of her problems as she has to do battle with a series of less than helpful colleagues. When it comes to the final performance, we learnt if all the perils and pitfalls could be avoided. Adding to this hilarity, the seven-year-olds in this production were played by adults and the teachers and parents were played by junior members of the company, with the adult members of the company enjoying and wonderfully protraying their inner children and perfectly capturing the atmosphere of a primary school class and their relationship with the adults in their lives, whilst in reverse the junior members of the company superbly acting beyond their years with all the authority, attitudes, body language and issues of adult life and the characters they are protraying. The Inaccurate Conception is a dark and clever comedy that both entertains and isn’t afraid to dig deeper into the lives of school children, their teachers and parents, before ending with a full nativity show full of hilarious overacting and childish behaviour that provided the biggest laughs of the night, and will be enjoyed by anyone who has ever been a child, a parent or working in the teaching profession, especially if they have ever directed, starred in or watched their own children in a nativity play and want to discover what really happens behind the scenes. As the first show I have seen by the company, based on this performance I look forward to seeing what they do next. The stand-out performance for me on the night came from junior member of the company Charly Henshaw as Celia Whibley, who perfectly captured the emotions and frustrations of a newly qualified teacher trying to do her best and control her class. As an audience member, it was easy to forget that Charly is not an adult herself, in a role that also required her to speak straight to the audience with great confidence and stage presence, and I believe she may have a great acting career ahead of her. My other stand-out junior members portraying teachers include Rosa Audus and Sasha Hudson as Miss Belcher and Miss Cusp who brilliantly portrayed their two-faced friendship of secretly hating each other and Celia, whilst loving a bitchy gossip, looking down on others and knowing they have to work together if they want their schemes to work; and Ethan Hudson as head teacher Oscar Dutton-Griggs who balanced authority and staff management with the stress of being part of the educational establishment and also provided the twist at the end of the show. All pulling off teachers far beyond their age (it will be interested to know if any of their own teachers watch them in this performance), I must also mention Edward Warren as disciplinarian Max Miller who believes there is no room for fun and creativity in school; and Ramsundar Athi as the spiritual and new-age music teacher Kurt Elginbrod. Out of the junior members playing parents, I must especially praise Harrison Henshaw as Spencer’s Dad, who perfected the tough exterior of the character, knocking confidence out of his son and portraying his lack of hope for him; and Keane Ward as unemployed, young, lonely, single father Bob, who is trying to cope with the trials of parenthood and raising his son Shane. All of the other juniors playing parents deserve a special mention, including Frankie Henshaw as the perfect lovey mother to wannabe star Jessica; and Aimee Fry as Spencer’s Mum who combined trying to be a good mum with being afraid of her son’s father as well as beautifully reciting Beatles lyrics. In regard to the adults playing students, stand-out performances include Suzanne Collett as Jessica for combining enthusiastic wannabe star with a lisp and tantrums; David Hague as the Scottish know-it-all Dougal; Dez Martin as Spencer, who sweetly pulled off his shy, poorly child character who had recently discovered the joy of playing with himself:and most of all Jarath Mukabi as Shane, who wonderfully portrayed the school boy who knows more about violence and adult life than he really should, whilst playing the role with the attitude and range of acting skills required, from Terminator to pub landlord and hardman. In terms of sound and music (thanks to Tim Scowcroft) this show represents the only time in February when you can get away with carols being played as the audience takes their seats; the voice over of bible verses and harrowing music between scenes added darkness to the show’s comedy; and on the 40th anniversary of the screening of the first ever episode of Grange Hill providing a fitting tribute by playing a snippet of the iconic theme tune between scenes. I must also congratulate the show’s director Christopher Boydell; the costume team Jennie Martin and Elaine Hallet for their adult versions of primary school uniforms and classic nativity costumes; Sally Taylor, Mike Bokalo and Dez Martin in scenery for the minimal set, accompanied by the lighting team’s (Amelia Mather, Kieran Hukin and Tom Holmes) spotlight that kept the audience focussed on the stars throughout the show. I must also praise the lighting team for their blackouts, which moved scenes forward and during the last minute preparations for the nativity cleverly pulling off the attempts of the parents of pulling off lighting. The Inaccurate Conception will be performed at Sheffield University Drama Studio at 7.30pm until Saturday 10 February. Tickets are £7.50 (plus a 94p booking fee) for adults and £5.00 (plus an 82p booking fee) for concessions. To book visit www.eventbrite.co.uk/e/the-inaccurate-conception-the-nativity-play-wot-goes-wrong-tickets-41527170886. 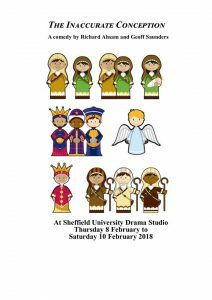 Hallam 89’ Theatre Club are a small amateur dramatic society based in Sheffield with a membership spanning all ages from early teens to pensioners. They stage two productions a year at Sheffield University Drama Studio as well as other occasional one-off performances and play-readings. For further information visit www.facebook.com/pg/Hallam89. P.S. Whilst watching the show, I highly recommend keeping an eye on all of the cast when they are on stage and not just those characters who are speaking, in order not to miss some tongues sticking out, pony tail pulls and other childish behaviour which will send you right back to your primary school years.